A new report says that Montgomery County schools are becoming segregated by income, race, and ethnicity and that "white flight" is occurring in the system's lowest-performing schools. But officials deny that it's even happening. This week, the county's Office of Legislative Oversight released their findings on the achievement gap in Montgomery County Pubic Schools. Researchers note that low-income, black, and Latino students are still lagging their more affluent, white, and Asian peers, but even more so now that both groups are increasingly concentrated in different parts of the school system. 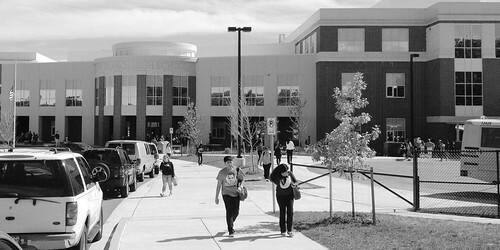 While MCPS as a whole is a majority-minority school system and has been for over a decade, most low-income, black, and Latino students attend one of 11 high schools: the Northeast Consortium, with Blake, Paint Branch, and Springbrook; the Downcounty Consortium, with Blair, Einstein, Kennedy, Northwood, and Wheaton; and three schools in the upcounty, Gaithersburg, Seneca Valley and Watkins Mill. Meanwhile, higher-income students, as well as 80% of the school system's white students and 67% of its Asian students, are now clustered at schools on the western side of the county, including the vaunted "W schools" in or near Bethesda. The result is an "achievement gap…between [high-poverty] high schools and [low-poverty] high schools," in which all students perform worse, notes Dr. Elaine Bonner-Tompkins, who produced the report. Students in one of the 11 "high-poverty" schools are less likely to graduate on time, to maintain grades high enough to participate in extracurricular activities, and to earn high scores on AP exams or the SAT. Meanwhile, they're nearly twice as likely to drop out of high school or get suspended. The study, which then-Councilmember Valerie Ervin commissioned, is a follow-up to a 2009 report about the Northeast and Downcounty consortia, which gave students a choice of several different high schools as a way to promote racial and economic integration, which studies show can improve academic performance. Both reports conclude that MCPS policies designed to reduce segregation "have not worked as intended." School officials were quick to dismiss many of the report's findings. In a four-page response, superintendent Joshua Starr called suggestions of white flight in MCPS "unsupported" and said that the school system wasn't to blame for larger demographic changes in the larger community. "The [Downcounty and Northeast consortia] communities have become important locations for families with limited means to reside and raise their children," wrote Starr, linking the growing concentration of low-income and minority students in East County schools to "disparities in the spread of wealth and race/ethnicity across the county." Starr also dismisses the notion that minorities or low-income students are isolated in certain schools. He says the report's own demographic findings, which come from MCPS data, "clearly demonstrates very diverse student populations at the consortia high schools." Does Starr really think a school like Wheaton, where there are few white students and almost 4 out of 5 students on reduced lunch, is a more diverse school than Whitman in Bethesda, where there are virtually no black or poor students? It's true that the school system isn't directly responsible for socioeconomic and racial segregation in Montgomery County. The western side of the county has historically been more affluent, and over time has drawn most of the county's jobs, shopping, and other amenities. 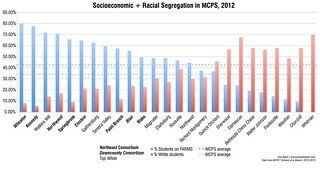 But MCPS does contribute to segregation so long as some of its schools are perceived as better than others. In their push for school construction funding, county leaders have noted that MCPS is adding 2,000 students each year, and that schools are becoming overcrowded. But for every high-ranked school like Bethesda-Chevy Chase High School, which is nearly 300 students over capacity, there are lower-ranked schools like Springbrook in Silver Spring, which was built for 2,100 but has just 1,700 students, and Watkins Mill, with nearly 500 empty seats. MCPS officials say this report isn't news. It's true: there have been warnings about segregation, and the potential consequences for Montgomery County schools, for over 20 years. But the school system has done little about it, and Dr. Starr insists that integration won’t close the achievement gap. As he points out in his letter, Dr. Starr does have some promising initiatives for closing the achievement gap, like smaller class sizes, or extra pay to recruit and retain strong teachers in high-needs schools, though he's not afraid to use them as a bargaining chip for more funding. That's why it's frustrating that he seems so unwilling to talk about or even acknowledge the school system's issues. The role of Montgomery County Public Schools isn't just to teach, or to prepare students for happy, successful lives. It's also one of the county's major assets, a tool used to attract families of all backgrounds who want to move here for their kids and for businesses who want to come here so they can hire our graduates. If there's an impression that not all Montgomery County schools are up to speed, or that some schools are for certain populations, that's bad for our kids, bad for our neighborhoods, and bad for our economy. We live in the Einstein cluster, and my son will start Newport Mill Middle School next year, which is about 50% Latino and has about 50% of students on FARMs. When I checked out NMMS, I was selfishly reassured to see that the scores for white students are similar to those at Tilder Middle School, where I went ages ago. Obviously there's a lot more to a school than its scores, and scores are a flawed measure. But as long as I can feel confident that my kids will be challenged, safe, and likely to do well (statistically speaking), I think it's great that they'll be going to vibrant and diverse schools on our side of the county. And, I do think the schools near us meet my criteria of having a critical mass of over-anxious, high-achieving, pushy helicopter parents like me, although perhaps not as many as on the other side of Connecticut Avenue. My friend is in a car on a highway going 65 miles an hour. I am in a similar car going 65 miles an hour, but I left 20 minutes after she did. If both of us keep going the same speed, will I catch up with her? If I speed up to 75 miles an hour, but she does, too, will I catch up with her? The only way I catch up is 1) to leave at the same time or 2) to go faster while she stays at the same speed, or 3) to go at the same speed while she slows down. This is what's happening in schools. The "achievement gap" isn't going to close until we change the incoming, external circumstances so that everyone begins with equal footing/resources. What has happened in the last few years is that due to targeted teaching methods, focus, effort, etc. that the performance of non-white students *has* increased, and increased to levels that many other school districts would love to see. But...those selfish white/Asian kids are taking those targeted, focused methods and benefiting just as much! The result? Everyone improves at comparative rates, and the "gap" still exists. Unless we provide *different* instruction to the kids on the undesirable side of the "gap", they won't "catch up." The worry then, of course, is that we start purposefully re-segregating schools (externally or internally) so that we can provide different instruction...and that's a slippery slope that doesn't help anyone. Studies show that socioeconomic factors have a much greater effect on academic performance than race. So we wind up ascribing academic issues to race rather than circumstances (because there is, whether we like to admit it or not, a correlation between lower socioeconomic levels and non-whiteness). Pay people a living wage. Make sure everyone has health insurance. Make sure that everyone has an up-to-date computer, internet access, library access, and parents or other adults in their lives who tell them that education matters and who hold their children accountable; watch literacy rates soar and eventually even out. That's the answer to the achievement gap. I'm tired of people pretending that everyone starts out on equal footing, that some kids aren't starting out with disadvantages. Everyone has the potential to achieve, but circumstances are vastly unequal, and they can't be compared to each other. But when the goal is to pop out identical drones who can pass standardized tests...why are we arguing about how quickly we can get them there? 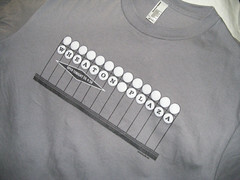 I graduated from Watkins Mill High School in 2006. We were the first batch of graduates from their International Baccalaureate program and also the last batch of graduates that came from both the lower income Montgomery Village neighborhoods, and the more affluent Germantown neighborhoods, east of 355. A year later they had opened up Clarksburg that took the majority of Watkins Mills monied white and asian population away. The problem doesn't lie only withe MCPS. The fact that neighborhoods segregate themselves in an attempt to create racially and financially insulated areas has been most of the reason that this occurs. Sounds like that area is ready for a consortium. Dan, I strongly believe that this is not an MCPS problem. Land use and transportation play an outsized role here - a role that many on the County Council don't seem to be interested in discussing. Take, for instance, the disastrous 1981 Eastern Montgomery County Master Plan, which I believe still lies at the root of many East County problems, even though it was superseded in 1997 by master plans that were drawn-up with much more community involvement. And now there are plans well under way to reprise the mistakes in the 1981 Plan, in the form of "repurposing" travel lanes on U.S. 29 in another ham-handed effort to increase transit patronage - that will likely drive away even more middle-class families (note that I make no reference to ethnic background) from White Oak and Fairland. The misplaced emphasis on forcing taxpaying residents to ride transit, much more pronounced in the East than the West (even though the Briggs Chaney area of Fairland is about the same distance from a Metrorail station as is River Road and Falls Road in Potomac) ultimately damages neighborhoods all up and down U.S. 29. A better way is to improve the business climate in the East County, shortening commute trip lengths instead of (mostly futile) attempts to increase transit patronage. You state " which gave students a choice of several different high schools as a way to promote racial and economic integration." Dan, I told you this in person, but will state it here again. just because "people" seem to say this and think it does not make it true. I was around when the Northeast Consortium was formed, and it *was not* devised as a way to promote racial and economic integration. Rather, it was created because a new high school needed to be built to alleviate overcrowding and the Board of Education did not want to have go through the terribly divisive and acrimonious process of redrawing boundaries. As a matter of fact, the original concept was called "Preferred Choice" and included *no* boundaries, just the Consortium area. I wish you and others would stop spouting your revisionist history. I've heard both arguments for the consortium before, and I've never seen any proof to say that racial and economic integration wasn't part of the reasoning. I didn't participate in the process for creating the consortium in 1998 (as I was in middle school), but I do know that part of the reason why MCPS received federal magnet school funding to start the consortia was because of integration. Dan, first, I mistyped, and meant to say that at first the process in the NEC was called Controlled Choice, and only after parents were concerned were the base areas drawn and the name changed to Preferred Choice. Your contention that the Consortium was to racially and economically integrate really makes no logical sense when you consider the demographics of the east county. The idea of a Consortium where students had a choice based on the signature program at a high school was that the students would be more invested in their education. I heard that fact stated more than once at meetings in the early days. And, even if the purpose was integration, which I will respectfully disagree with you about, why continue to harp on that? To what end? What is your goal? To end the Consortium? Think carefully about that option. The school boundaries for the three high schools would likely revert to the base areas in place already, and might end up making each school even less demographically diverse. I agree that ending the Consortia would only make the schools more segregated. As I've written before, the key is to make these schools and their signature programs (as well as the neighborhoods they serve, as C.P. notes) stronger and more attractive to families of all socioeconomic levels. Well, first of all, Sherwood was included in the original plan because it was overcrowded. In fact, there are students that live in areas that used to be served by Sherwood that are now in the Blake HS base area. They were put there to help alleviate overcrowding. If indeed your goal is to strengthen the schools in the Consortia, I do not see how claiming that the Consortia were formed to desegregate will help. In my opinion, advocacy must focus on student and need based funding of our schools. For instance, staffing of certain positions in the schools, for instance HS registrars and elementary school counselors, are not based on the student enrollment. That is just plain wrong - when you compare the vastly different enrollments across the county. I think you are just spinning your wheels until and unless you learn to focus your advocacy on what will truly make a difference.